You will have to look closely at this photo to see what I saw out of the corner of my eye. 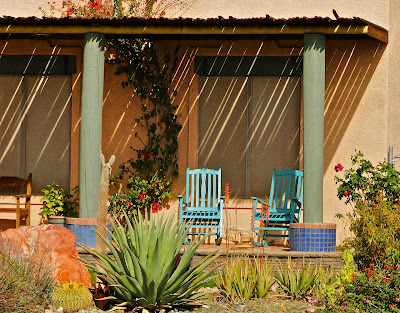 Do you see that hummingbird near the agave bloom? 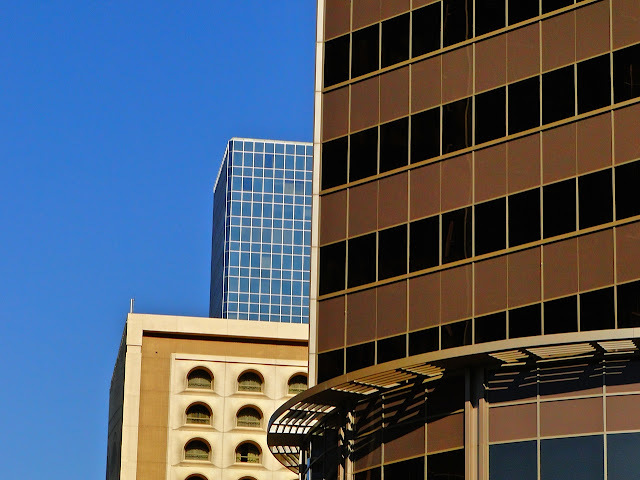 It was one of those moments when I had the wrong lens on the camera and no time to change it. I just swung around and took the shot and hoped for the best. 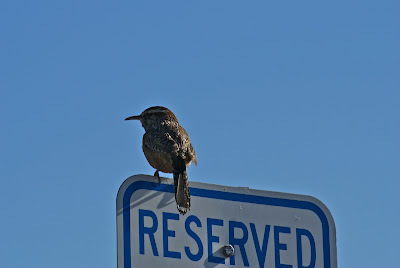 I was surprised that I could see the birds brightly colored head and the incredibly fast motion of his wings. This looks like a good place to relax and have a quiet conversation with a good friend. I went to another Phoenix Sun's Basketball game a few days back and it gave me an opportunity to snap a night shot of the front of the US Airways arena where they play. I took this almost 2 hours before the game started so there wouldn't be thousands of people standing in the plaza. Another example of agave blooms. They come in so many wonderful shapes, sizes and colors. I found another one of those houses with a strange set of yard ornaments. 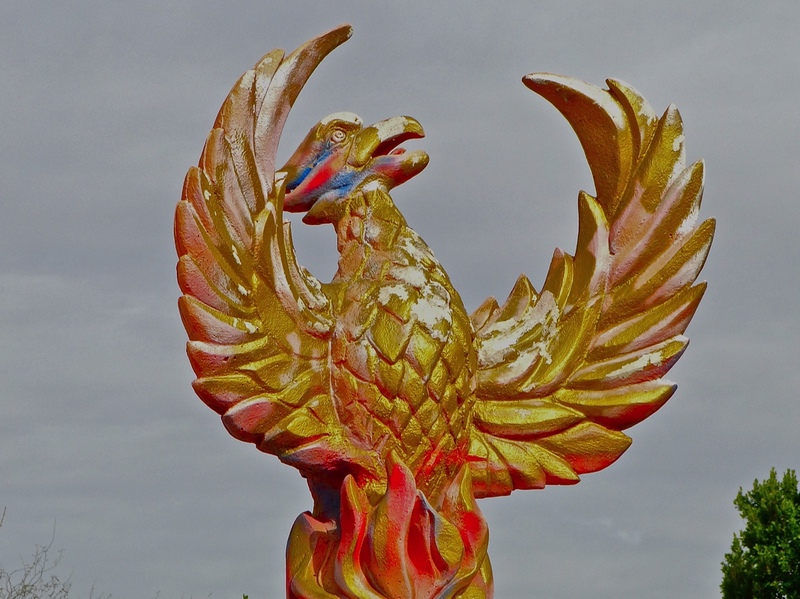 The large Phoenix bird is a nice touch. When I spotted the sky turning pink, I drove over to my favorite viewing spot on the Encanto Golf Course to catch a sunset shot. 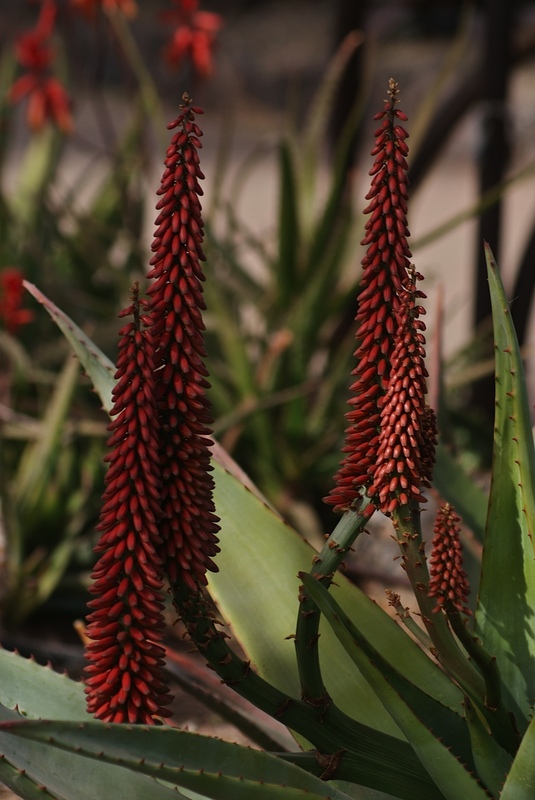 I never tire of seeing them. 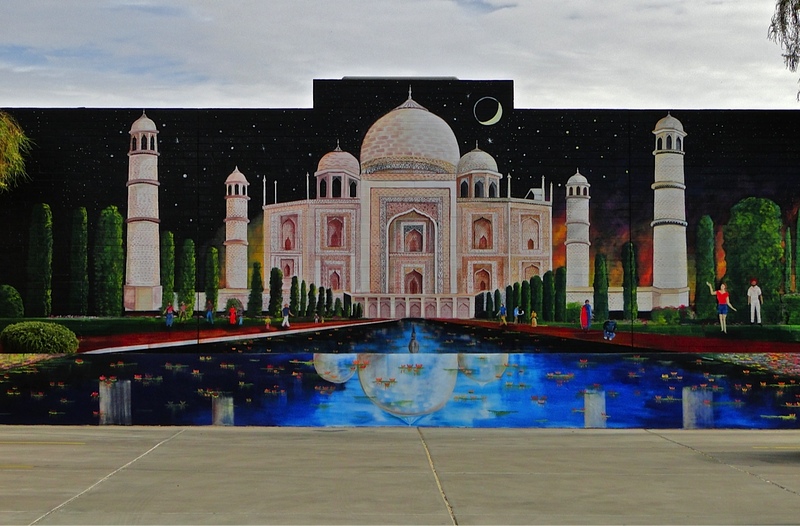 One of my favorite Indian Restaurants (Indian Delhi) has added this gorgeous mural to the wall that abuts the parking lot for the restaurant. You almost feel like you could walk into the scene. There is a lot of agave blooms popping up around town and this little bee has latched on to one of them. 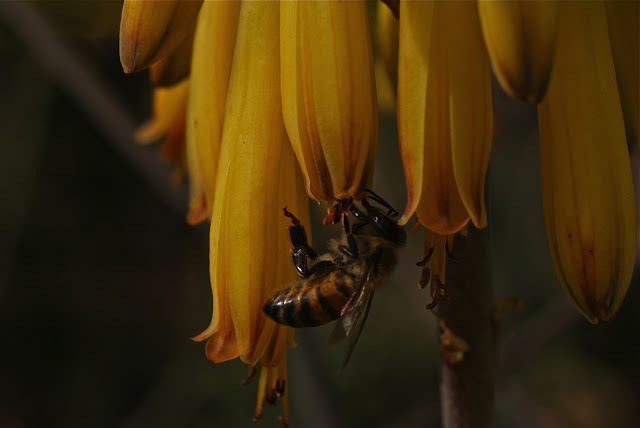 I played around with the macro lens this last weekend. 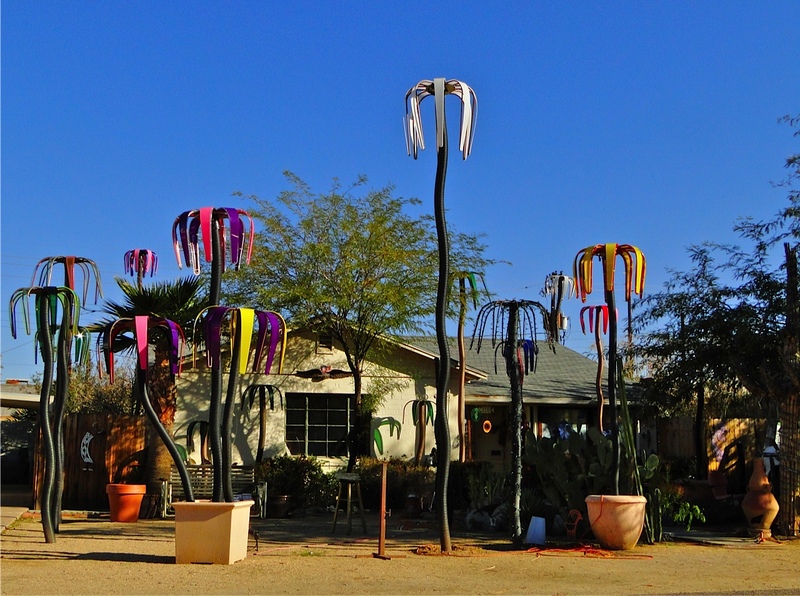 There is an interesting exhibit at the Desert Botanical Garden right now called "Design for a Living World". It features several well known designers who have used sustainable materials from around the world to recreate everyday objects. The photo above is of a lounge chair made from metal and bamboo. 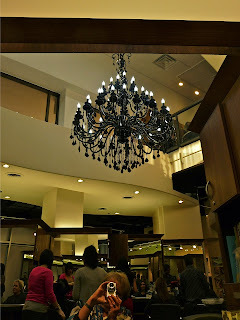 I also saw some shoes and a dress made from salmon leather and designed by Isaac Mizrahi and a handbag designed by Kate Spade made from rosewood. My favorite thing was the chocolate from Costa Rica and the handy little grater that you grate the chocolate into, tip it over into a cup of hot water, and then use it to stir the chocolate to make a nice cup of hot chocolate. Now that is a handy tool. 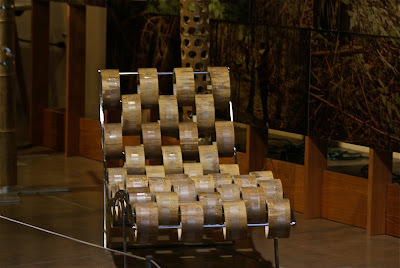 To see more about the exhibit, click this Link to the Nature Conservancy. 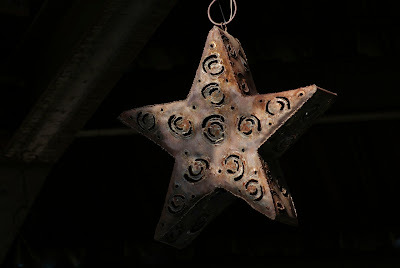 I found this tin star hanging from the ceiling of one of the entertainment pavilions at the Desert Botanical Garden. 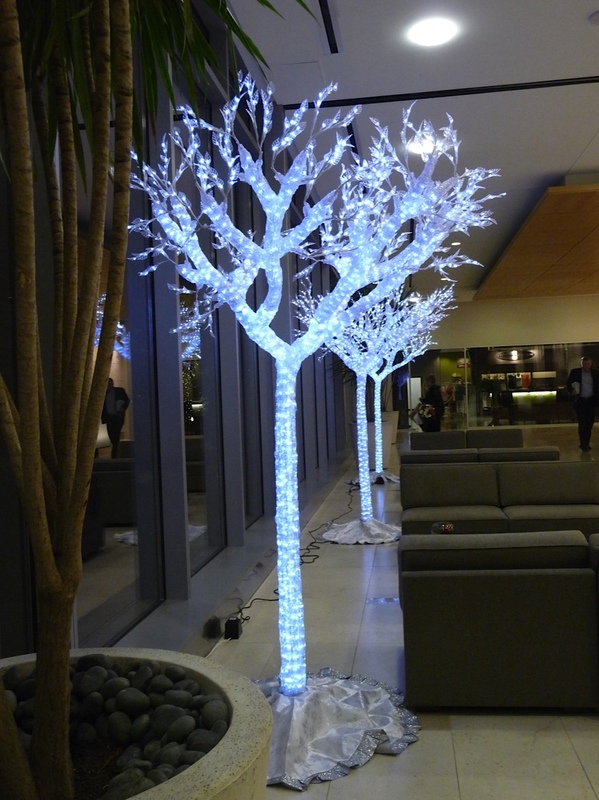 I found this lighted tree in the lobby of a new downtown high-rise building. 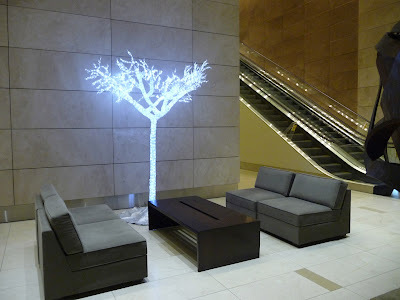 I went up those escalators you see and found more on the second floor lobby. 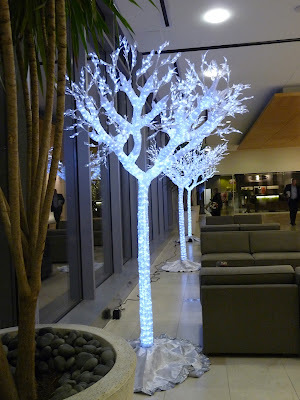 These might be left over from the holiday decorations! A big Thank You to all of you who responded to my request yesterday. 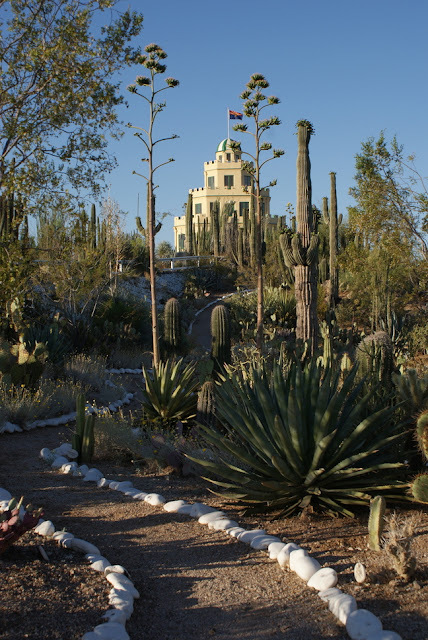 Most of my readers know that I have been working with the Tovrea Carraro Society to help open the Tovrea Castle for public tours. We've been given a very unique opportunity to receive a $25,000.00 grant from the Intuit Company and all we have to do is get people to vote for us on the "Love a Business" website. They count the votes by individual email addresses, one vote per address is allowed. If all of you loyal readers could send a vote, it would go a long way to put us in line for this grant. The grant would be a gigantic help to us getting this project off the ground. If you click on this Link, it will open to the Intuit website with Tovrea Castle already selected. All you need to do is complete step 3 by entering a name (any screen name will do) and your email address (they will not send you spam). You can also enter comments if you want, but it isn't necessary. Then click VOTE. 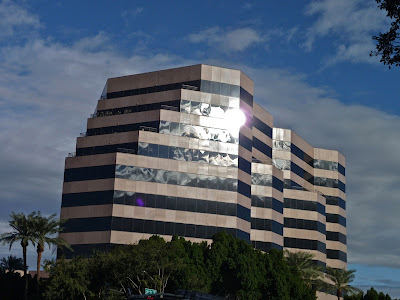 I'm seeing sun spots reflected off of this office building at the corner of 24th Street and Camelback Road. 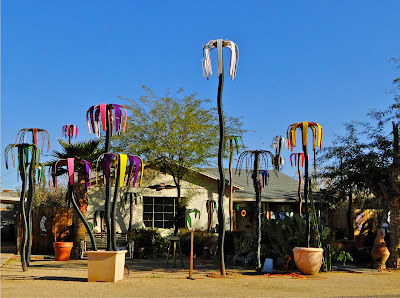 Since posting the house with the many plastic palm trees last week (scroll down or click here), I've learned that the owner makes the palm trees and sells them. 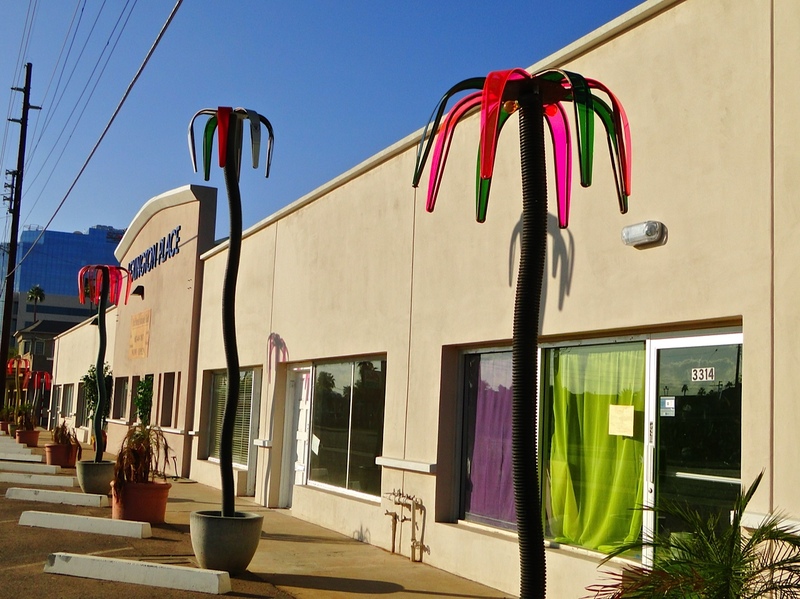 Here we see an assortment that decorates the front of a row of businesses on 3rd street very near where the house is located. 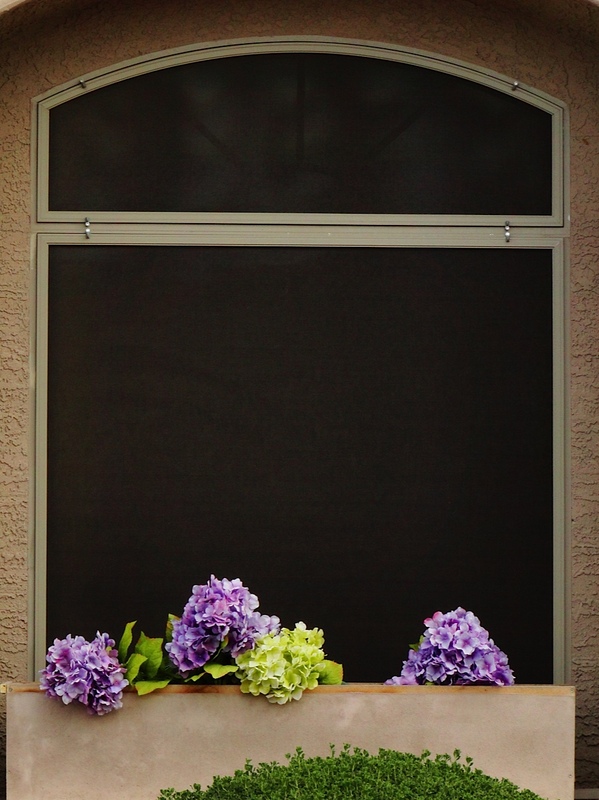 I saw these hydrangeas blooming in this window box and was enticed to take a photo. 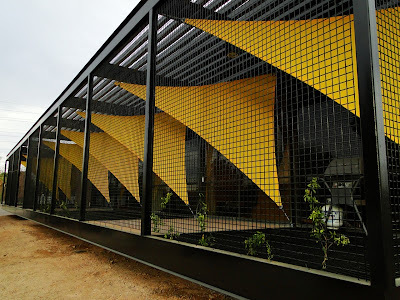 This was taken at the back of the offices for Richard Bauer Architects. This office building is within walking distance from my house but, I just noticed these sails recently. 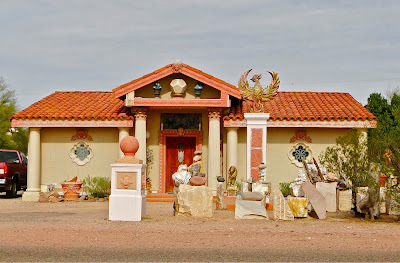 The firm of Ricard Bauer has many wonderful buildings in Arizona and I've even featured some of them. Most recently I had photos from the new South Mountain Library adjacent to the South Mountain Community College Campus. The work this firm does makes my heart sing. I love everything they've done and you can see a sample by clicking on the link to their web site here. The firm specializes in Libraries and have won many awards for their designs. 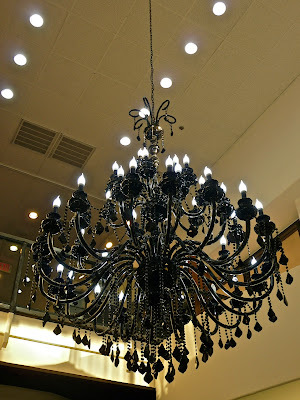 They even designed the interiors of two of my favorite neighborhood restaurants, Cheuvront's Wine Bar and Fez. More downtown Phoenix buildings. Reflections are everywhere! 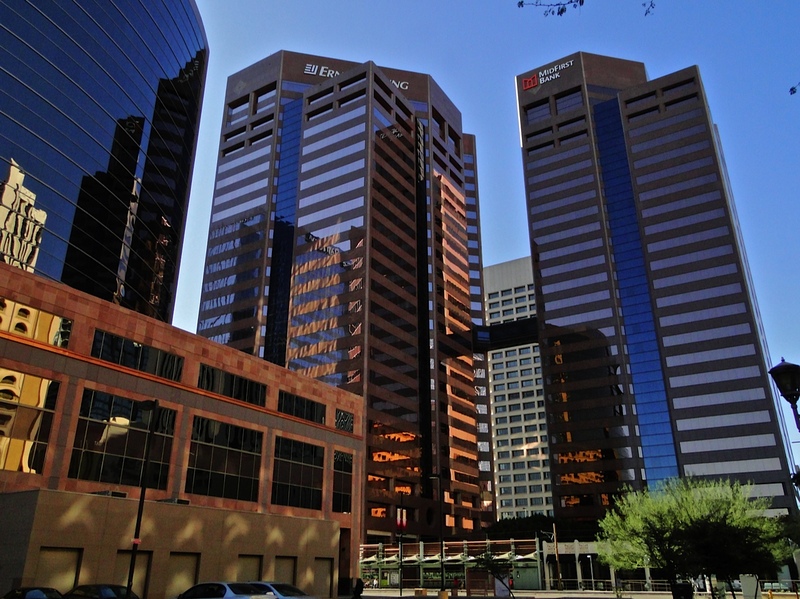 The different styles of buildings in downtown Phoenix. 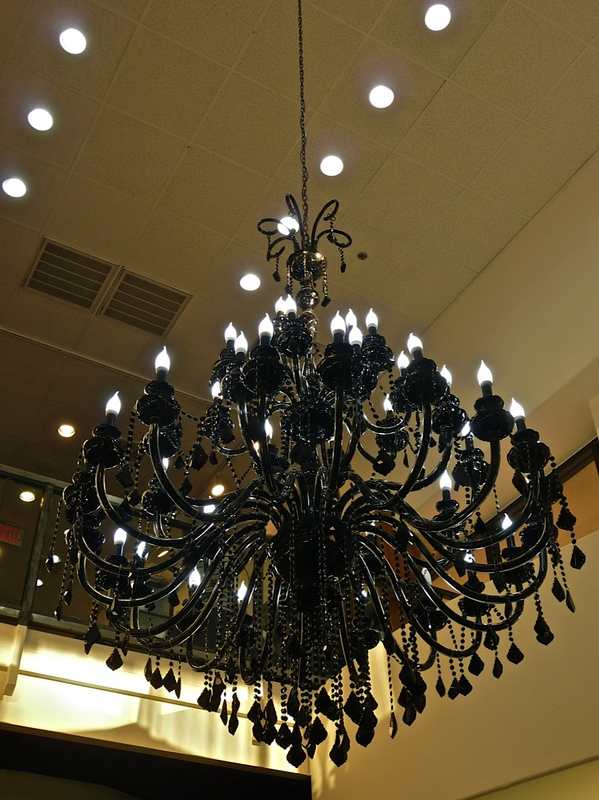 My hair salon has added something new, a black chandelier! I don't think I've ever seen one in black before. I like it. Here I am sitting in the chair and snapping a quick photo of the new decor as reflected in the mirror in front of me. 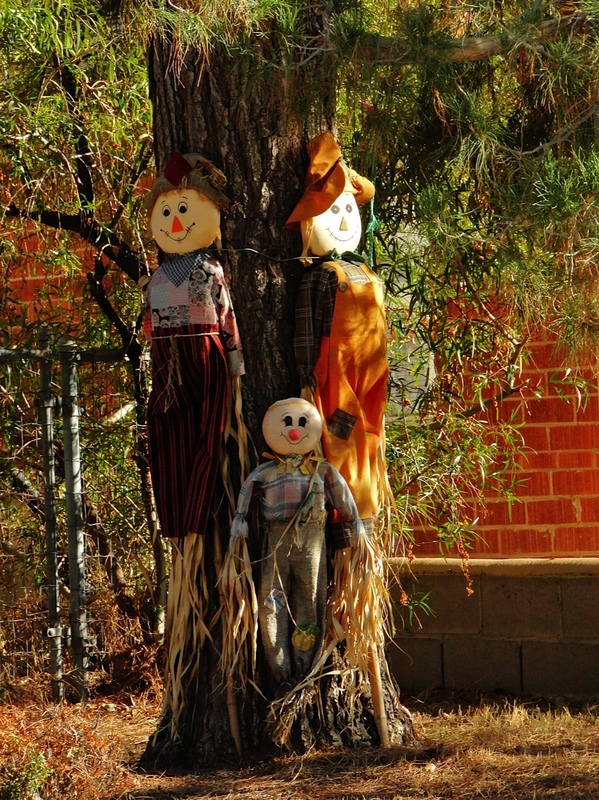 The same day I found yesterday's house with it's colorful "palm trees", I also spotted this family of scarecrows bound to a tree in the front yard of another house. They appear to be quite pleased to be there. A week ago, I found this house not far from where I live and had to turn around and go back for another look. Well, I guess the good news is that they don't have to worry about trimming these "palm trees". When I was a kid, my dad used to tell us kids he was off "to get a bushel basket of 'maters". And, sure enough, he'd come home with a big basket of the most beautiful tomatoes you've ever seen. 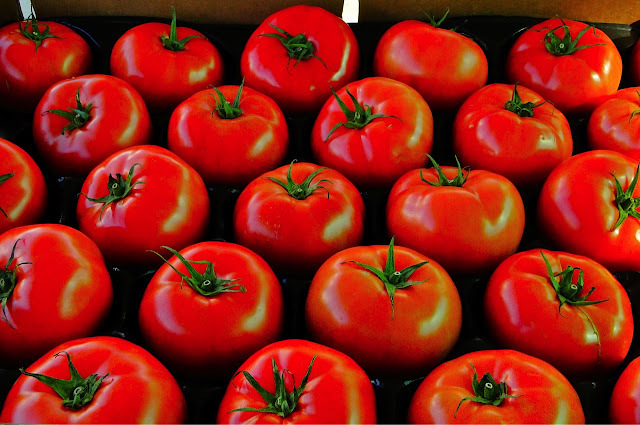 Ah....if only these beauties would taste as wonderful as those 'maters of my youth. A new eating and drinking establishment in downtown Phoenix is this place called The Tilted Kilt. 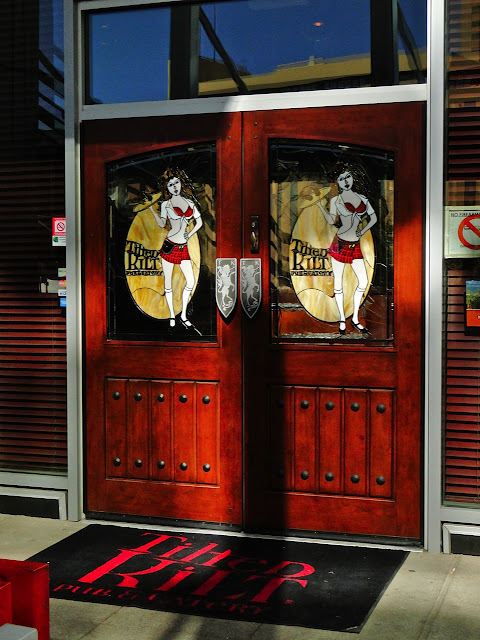 In case you were wondering, yes the young, female wait staff wear exactly what you see depicted on the door. I won't even begin to comment on the need for some establishments to have young, scantily dressed girls serving food and drink in a sports themed environment. I could say.....no...I'm not going to comment. I was surprised to find this outdoor ice skating rink right in downtown Phoenix Friday night. 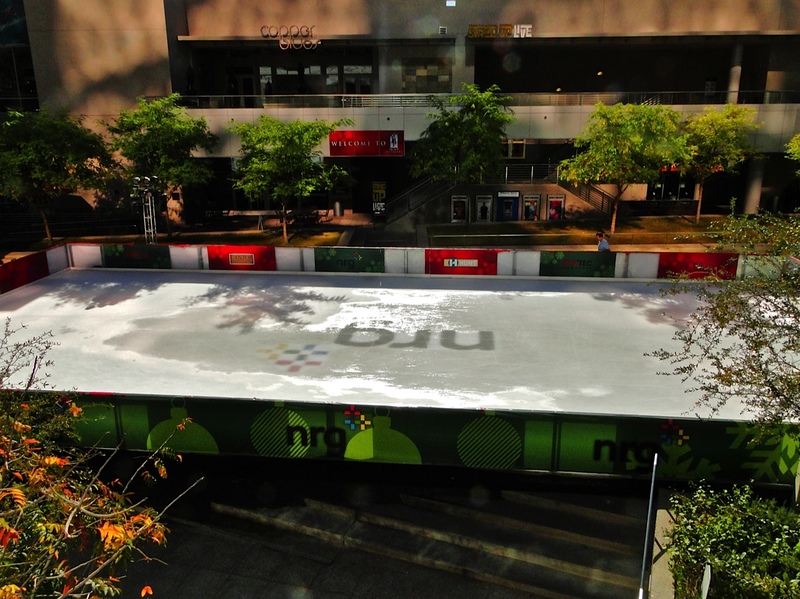 With daytime temperatures hovering around 72 degrees (22C), it must be expensive to keep this rink frozen. 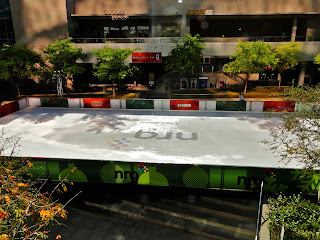 I went back Saturday around noon hoping to get a better shot than the one above but, no one was there skating. 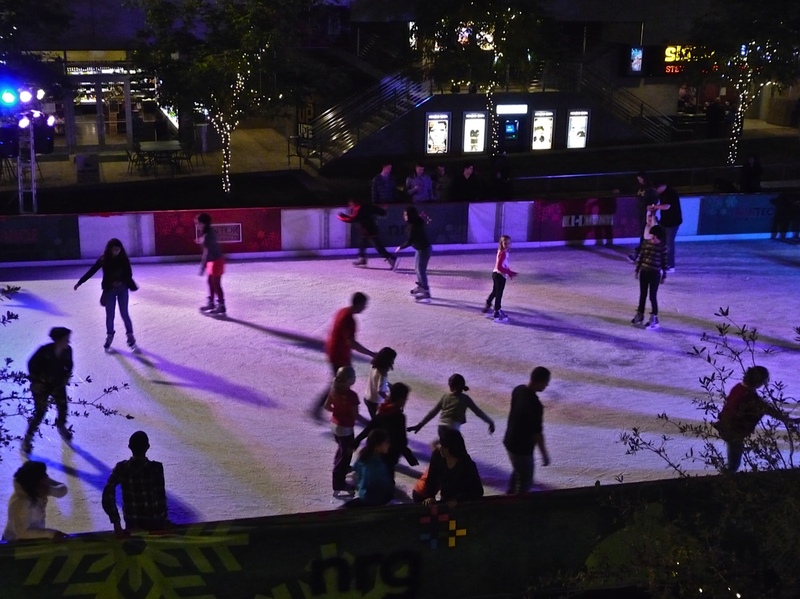 So, even though this one is clearer and brighter, with no action it's kind of drab. 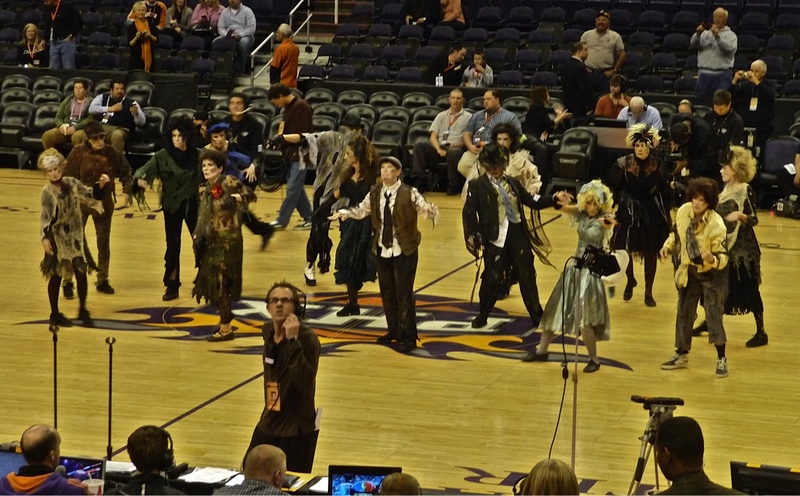 I'm not sure if I should feel young or old after seeing this group of senior citizens perform a dance routine to Michael Jackson's "Thriller" last night before the Phoenix Sun's Basketball game. 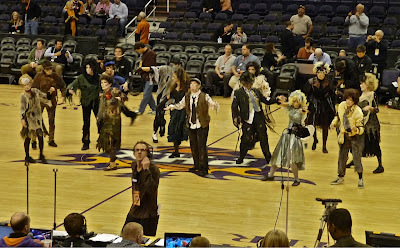 Most of the members of the dance group are older than I am but, they sure had all the right moves. It turns out the Sun's had some pretty good moves too since they beat the NBA leading team, the Portland Trailblazer's 102 to 77. 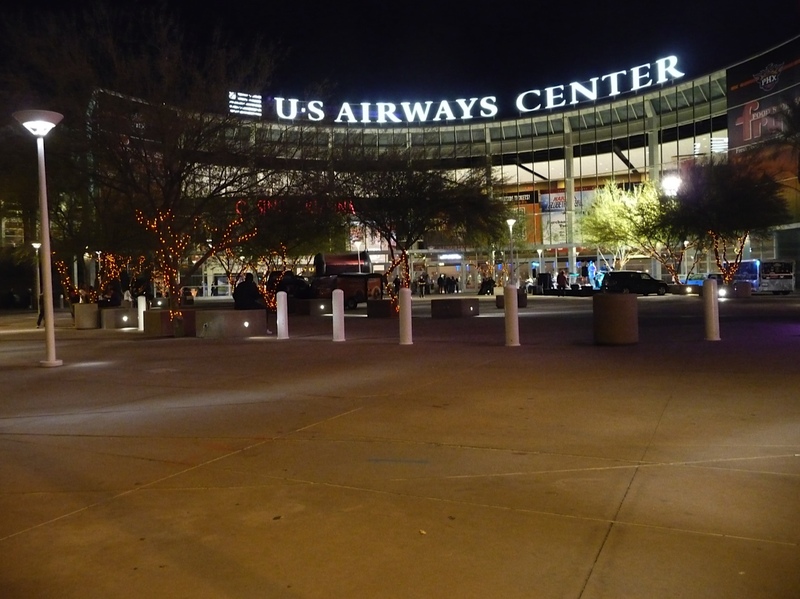 It was a fun night for everyone with the possible exception of the Portland fans. 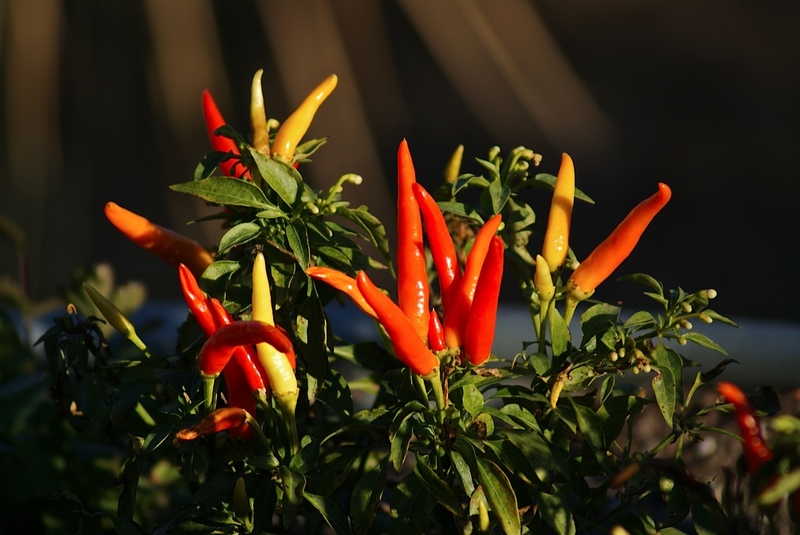 Yesterday it was chillies for sale, today it's chillies still on the plant. These look like they are ready to be picked. 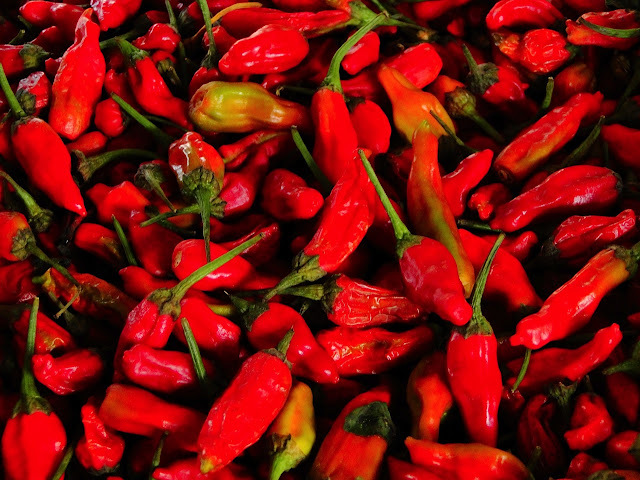 A big basket of these red hot beauties is always available at the Farmer's Market. Last time I was there I decided it would make a great shot! 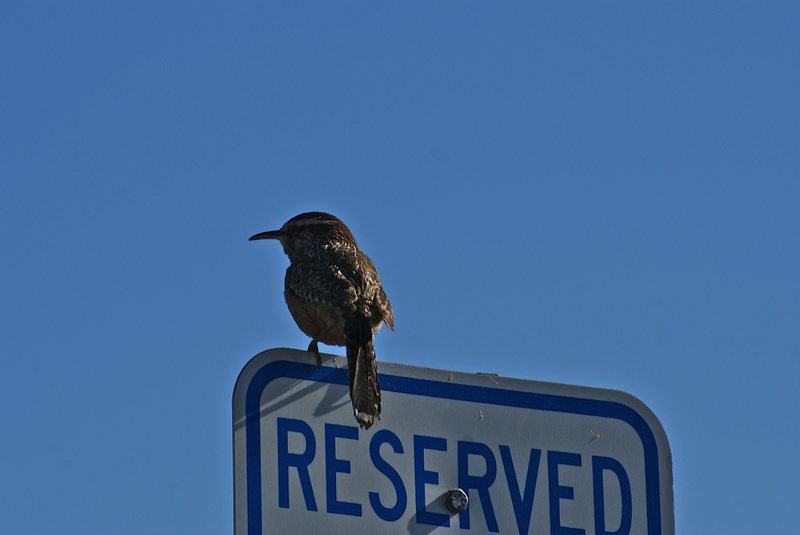 Looks like this little cactus wren has found a perfect spot to observe his surroundings and it seems it's reserved just for him. 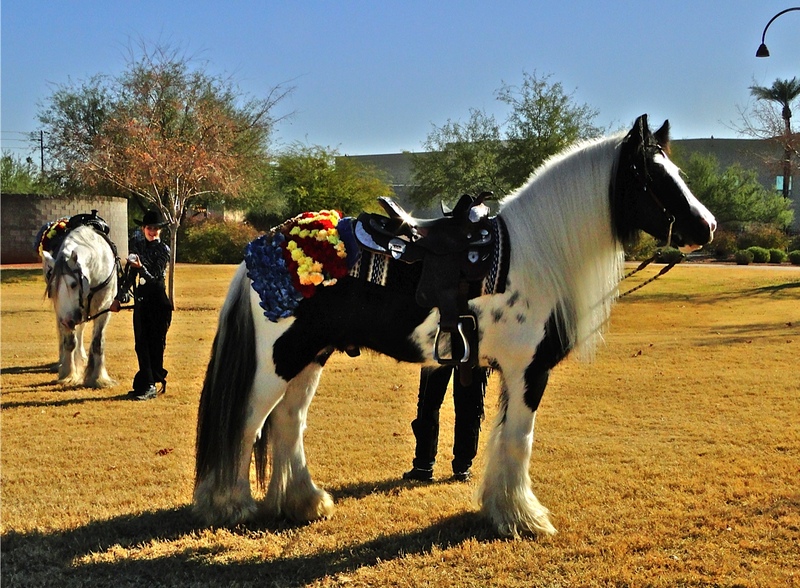 Another horse group I encountered at the Fiesta Bowl Parade staging area was a group called the Desert Jewel Gypsy Horses. I was told the breed is called Gypsy Vanner and it originates from the U.K. and Ireland. 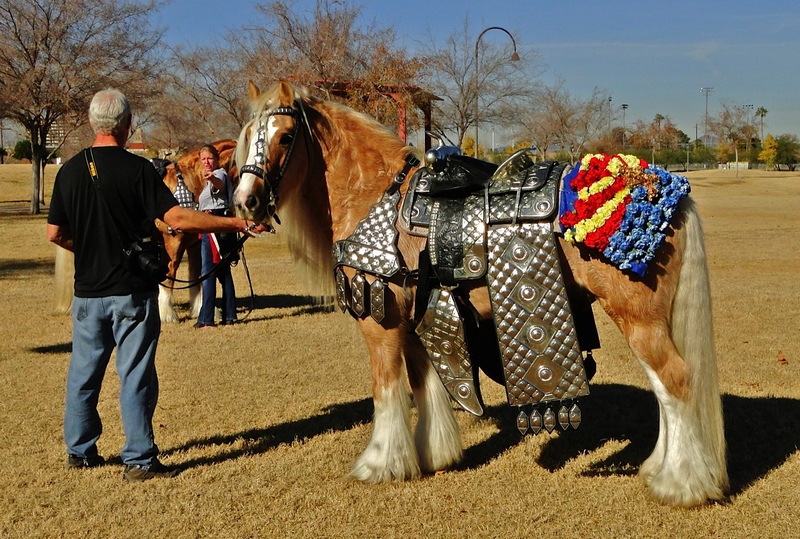 The horse is distinguished by it's heavy build and abundant feathering on the lower legs. 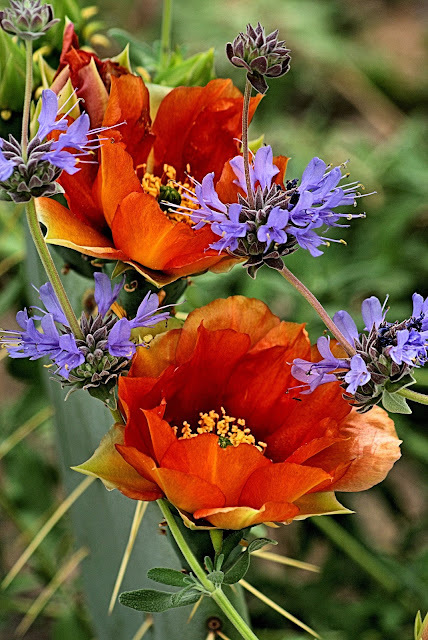 I think they are quite beautiful. 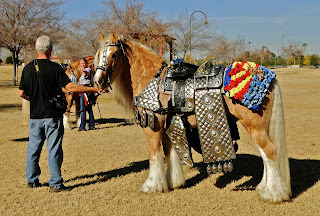 I have to admit, I didn't go to the Fiesta Bowl Parade on New Year's Eve. But, I did go to one of the staging areas immediately following the parade to see what I could see. 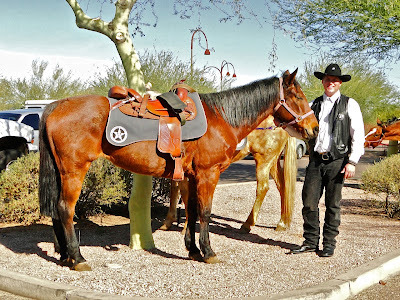 The staging area closest to me was where all the various horse groups had gathered. 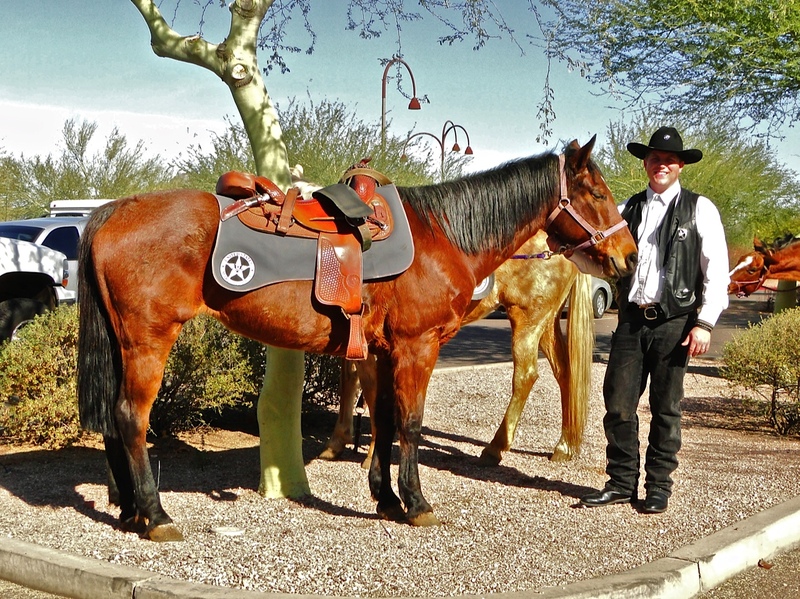 I asked this man for a photo of him and his beautiful horse and he kindly obliged. He is a member of the U.S. Marshal's Posse! This was quite a large team as there were horses all around me when I snapped this shot. This year I had a very hard time choosing my photo of the year. I had so many that I liked very much. In the end I chose the one that was my favorite. 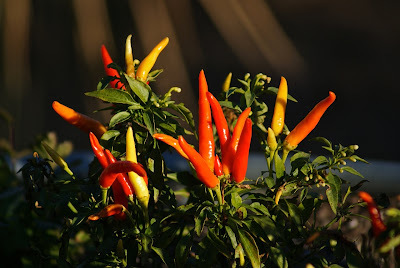 I think the light was perfect on the subject and the colors just pop on the photo. 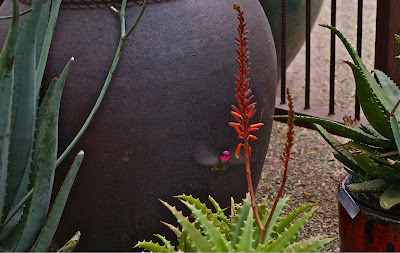 I posted this one last April when all the cactus were in bloom. 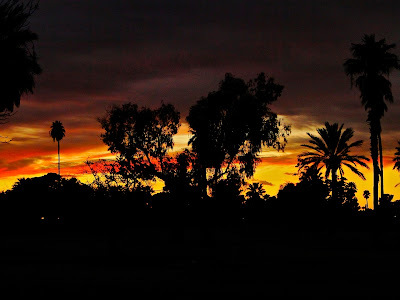 Click the link below to see all of the photos of the year from all of the City Daily Photo Bloggers.